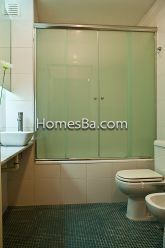 2 bedrooms´apartment in a new building,(three years old) located between the train stops of Belgrano and Nuñez. 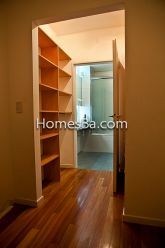 (Tigre railway) (Approximately 7 blocks from each stop), 200 meters from Libertador Ave. and 6 blocks from Cabildo Ave.
2 bedrooms, 2 bathrooms, bright, new, spotless. 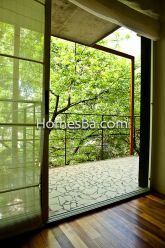 Full kitchen, wooden floor, beautiful balcony accessed from both bedrooms and from the living-room. Season swimming pool and barbecue.Meeting saloon and solarium. 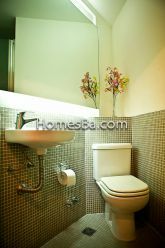 Master bedroom with en suite bathroom, with dressing.There is bathtube in main bathroom. The second bathroom has a shower. You reach the balcony both from the living room and from the 2nd. bedroom. All rooms are bright and onto the street. 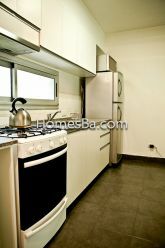 Modern kitchen,with fridge with freezer, gas stove with oven, microwave, blender, toaster, washing machine, dryer. Water heater in the apartment. Air conditioning (C/H)in each room. Very quiet location between Núñez and Belgrano. Highly recommended. Close to train stops, and 6 blocks from Cabildo Ave. Season swimming pool. Only used in summer. Grill for making asados. Near to: Museums, Churches, Discos, Parks, Cinemas, Restaurants, Stores, Banks, Wash Stores, Bus Stop, Coffee Stores, University.